This parsons chair will be the perfect addition to your formal living room or dining room arrangement. Designed to represent high-end luxury, this chair features a plush seat cushion and padded back, offering a supportive sitting comfort. Details abound with nail head trim around the top of the skirt edge and up and around the back sides and top. 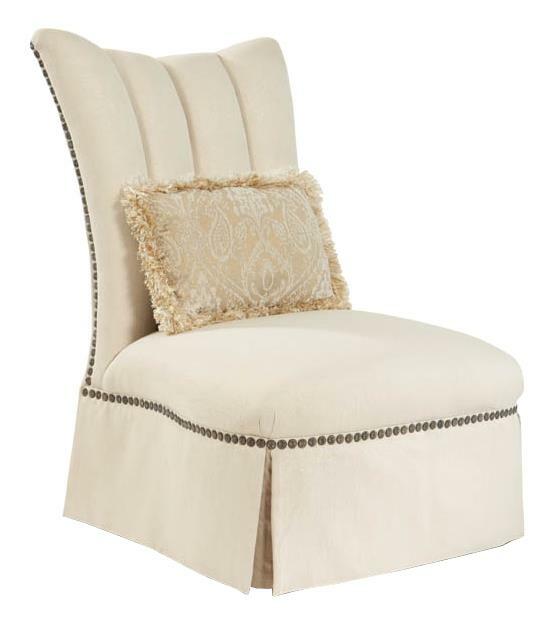 Two gem-encrusted broach-like accents adorn the seat back offering beauty in the area where you'll see it most, assuming you place this chair at a dining room table or in the open area away from a wall. Entirely traditional and full of elegant charm, this chair is one that will please. The Cinderella Armless Parsons Chair with Broach Accented Back by Rachlin Classics at Stoney Creek Furniture in the Toronto, Hamilton, Vaughan, Stoney Creek, Ontario area. Product availability may vary. Contact us for the most current availability on this product. Arm Armless, parsons chair construction for easy seated movement. Seat Supportive, padded seat cushion with nail head trim border. Leg or Skirt Traditional chair skirt with corner pleats.